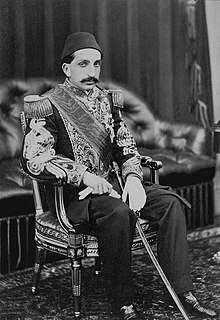 Abdul Hamid II (21 September 1842 – 10 February 1918) was the 34th Sultan of the Ottoman Empire. He was the last Sultan to effectively rule over the empire, which was coming to an end. He was son of the Sultan Abdulmecid. ↑ "Abdulhamid II". The Sultans. theottomans.org. Retrieved 22 February 2016. This page was last changed on 21 February 2016, at 20:49.